In true pirate treasure map form, an ‘x’ marked the location of the party on our front gate along with a few red, white & black balloons. When guests arrived they could don themselves with pirate scarves (stripy fabric cut into triangles) and eye patches as well as get a scar or moustache painted on their face with face paint and a pirate tattoo! 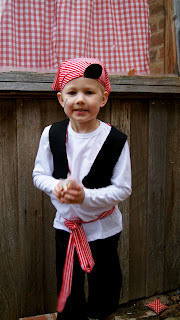 We set up a bit of a photo booth to take photos of all the little pirates, but to be honest, it didn’t really get used. Next time, I’ll do it in a more obvious spot and make sure there is someone given the specific job of taking photos in the photo booth. Our pirate ship was made from an old plasma TV screen box (thanks to hard rubbish!) with enthusiastic help from Bear & Frog and the kids are still enjoying playing with it! 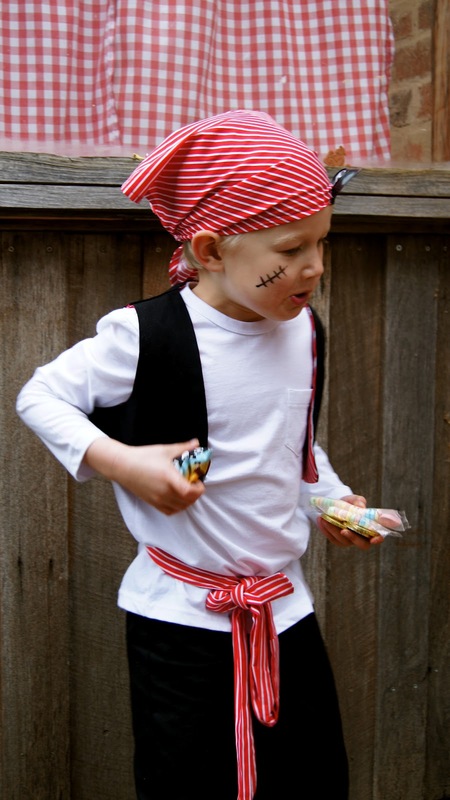 walk the plank & receive some treasure for your loot bag. 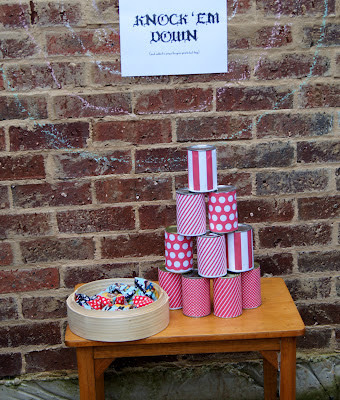 Knock down a tin can pyramid with rice bags and receive some treasure for your loot bag. Small rice bags thrown at tin cans covered with some printable paper. Toss large silver coins into treasure chest to receive some treasure for your loot bag. Coins made from cardboard circles (the portholes from our cardboard pirate ship!) covered in aluminium foil & frisbeed into a large box. Gold coins buried in the sandpit which were then swapped for chocolate coins. 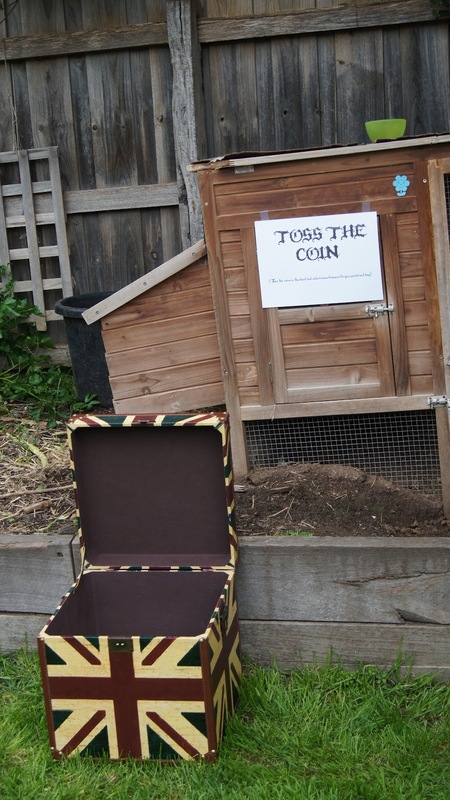 We learned our lesson at an ‘underwater’ themed party a few years ago where we buried chocolate coins on a very hot day… you can imagine what happened! 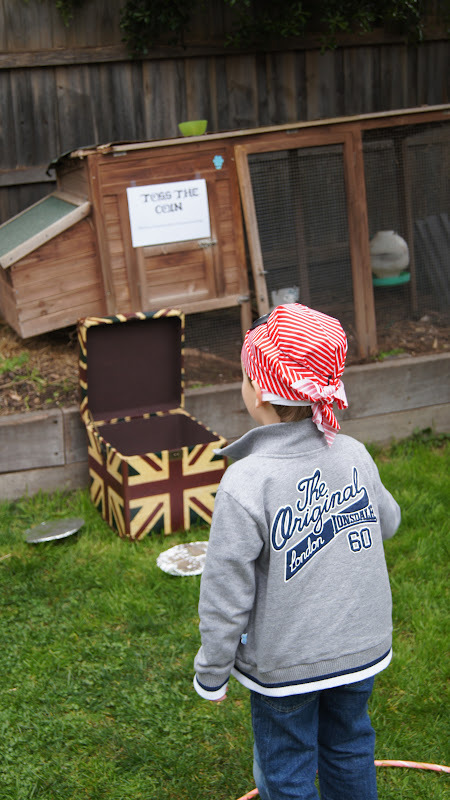 Place an ‘x’ sticker where you think the treasure is buried on the pirate treasure map. No blindfold required! I just placed an ‘x’ on the back of the map and the children had to guess where it was. A treasure chest pinata filled with treasure of chocolate coins and candy jewellery. I have made pinatas in the past (well worth a go! ), but when I saw this treasure chest at my local discount party shop I thought I’d save myself the effort. 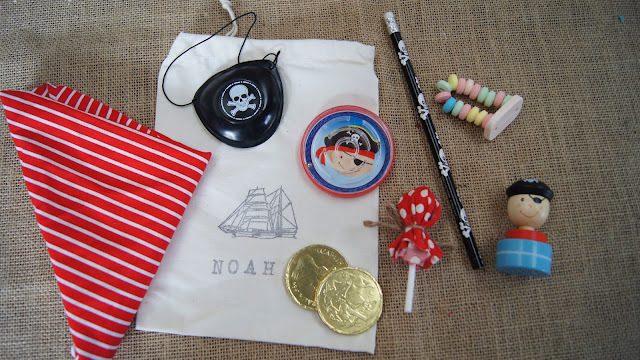 At the end of the party, their pirate ‘loot bag’ was their take home bag filled with the goodies they had collected during the party. ‘Pirate’ is a very popular theme, so no trouble at all finding inexpensive pirate themed goodies! Had to include the following shot, ‘coz Grandpa & Uncle Thomas coming all the way from Adelaide for the party was pretty special. Always a little sad when party time is over – bring on the next one! 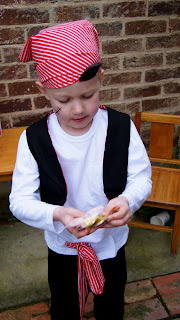 Pirate Party food – click here. 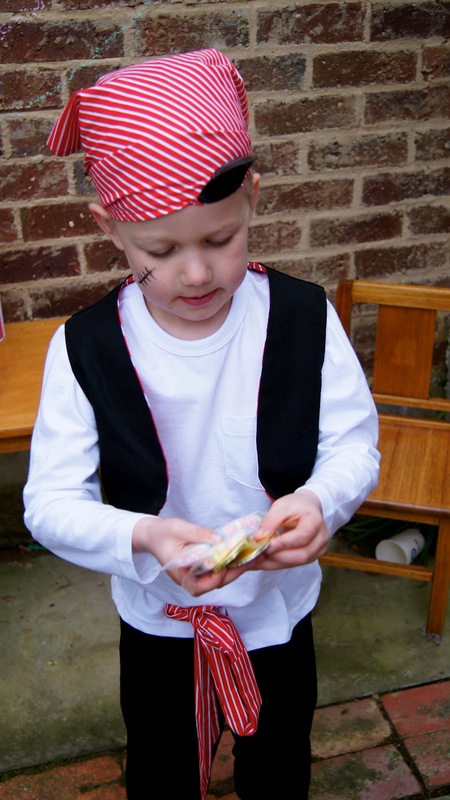 Pirate Party invitations – click here. More FGB parties – click here. * I purchased these muslin bags on etsy.com and then stamped a ship stamp and the child’s name. Standout party Emma! Well done. 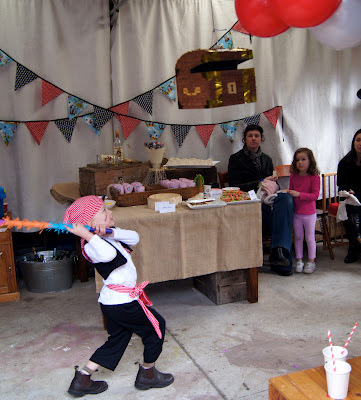 Guess the kids enjoy this pirate parties and I also love their pirate costumes and glad to know that instead they hire a photographer they choose to use the <a href="http://www.dreambooth.co.uk/&quot; rel="nofollow">Photobooth</a>.